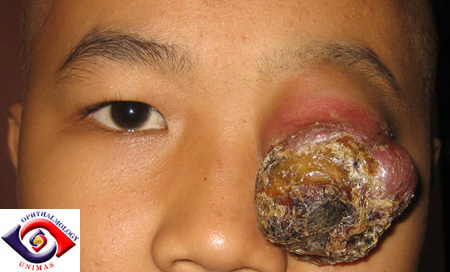 This 12-year-old boy from Indonesia developed an itchy lump in his left upper lid in December 2004. The lump was excised in a local hospital in February, 2005 with out histology. The lump recurred a few months later. The patient consulted a private ophthalmologist in Kuching and the lump was biopsied in August, 2005. Histology revealed pleomorphic rhabdomyosarcoma and the patient was referred to the oncologist in Sarawak General Hospital. Two cycles of uncomplicated chemotherapy were given in August and September, 2005. However, the tumour failed to respond to the treatments and grew rapidly with central necrosis (Figure 1,2). There were no signs of metastasis on physical examination. Ocular examination was difficult but the patient was able to perceive light (Figure 3). The mass was rubbery and appeared to extend into the orbit. A decision was made to debulk the tumour before further chemotherapy and radiotherapy. Urgent CT scan showed the tumour was confined to the upper lid ie Group III according to Intergroup Rhabdomyosarcoma Study Group Staging Classification (IRSG)(Figure 4). Figure 1.Fungating tumour of the left upper lid (front view). Figure 2. Tumour viewed from the side. Figure 3. The globe could not be opened but the eye could perceive light. Figure 4. Tumour of the upper lid displacing the globe laterally. No signs of orbital extension or bony involvement. a. What are the different cell types of rhabdomyosarcoma (RMS) and which ophthalmic structures are the most commonly involved ? b. Should exenternation be performed in this patient? c. What procedures could be performed during the surgery? d. When would you consider further treatment after the surgery?